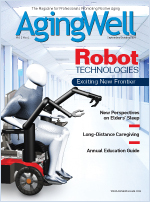 Robots capable of assisting with activities of daily living, providing companionship, and promoting wellness promise to enhance quality of life for older adults and their caregivers. Fast-forward from long ago and a galaxy far away to earth circa 2009, and we see elements of science fiction quickly entering everyday reality. Beyond the nearly ubiquitous talking GPS units that help us navigate city streets and the Roomba, a robotic vacuum cleaner from Bedford, MA-based iRobot that has sold nearly 2.5 million units since 2002, much of the technology being developed at universities and corporations around the world is targeted toward helping older adults and individuals with disabilities. Worldwide, the market for personal and service robots is predicted to explode. According to ABI Research and the Japan Robot Association, business will grow from $3 billion in 2008 to $15 billion by 2015. With the right mix of ingenuity, funding, and sustained development, robots with artificial intelligence may well provide meaningful social interaction for older adults suffering from dementia, Alzheimer’s disease, and possibly even from loneliness. To enable aging in place, mechanized technologies could assist with activities of daily living, such as cooking, mobility, exercise, driving, and communication. Machines may even be able to carry out basic medical tasks and present cost-effective alternatives to human services that strain an already overburdened healthcare system. “If the technology we develop can delay the need to send people from their homes to assisted living or nursing facilities by even one month, we can save our nation $1.12 billion annually,” says Jim Osborn, executive director of the Quality of Life Technology Engineering Research Center (QoLT ERC), a joint project between Carnegie Mellon University and the University of Pittsburgh. In 2006, the QoLT ERC labs received a $15 million five-year grant from the National Science Foundation to conduct “transformative” research. Their goal is to foster independence and self-determination among older adults and individuals with disabilities and create new possibilities for those inhibited by housing and transportation designed for able-bodied users. Even larger populations will find many of the results to be useful and desirable. “Using robotics and machine learning, we provide technology for assistance with mobility, manipulation, and exercise. We also aid people suffering from mild cognitive impairment,” says Rory Cooper, PhD, codirector of the QoLT ERC and the Paralyzed Veterans of America Chair and distinguished professor at the School of Health and Rehabilitation Sciences at the University of Pittsburgh. Scientists envision a day when it will be no surprise to find a grandmother living with a household robot like uBot-5, developed at the University of Massachusetts Amherst, which helps her lift things, uses a stethoscope to check her vitals, dials 911, and provides video conferencing to keep her in contact with the outside world. While it costs around $65,000 to construct in the labs, its creators anticipate a $2,000 price tag for mass production. Compare this rate with the cost of human caregivers that can easily exceed $1,000 per week, and the savings become clear. To get around town, this tech-savvy grandma may use a smart driving assistant such as NavPrescience, in development at the QoLT ERC, which learns from observing her conservative driving habits. Recognizing that she avoids bridges and left turns at busy intersections, the machine would automatically plan an appropriate route, avoiding such areas. Feeling comfortable at the wheel, she may venture off the beaten path to get specially fitted for the new iShoe, created during an internship at NASA by a graduate student at the Harvard-Massachusetts Institute of Technology division of health sciences and technology. The insole allows doctors to detect balance problems in order to prevent falls. Within the next two years, the iShoe could be available on the market for somewhere between $100 and $300. “The important thing is that the word ‘robot’ does not just mean autonomous robot,” says Takeo Kanade, PhD, the U. A. and Helen Whitaker University professor of computer science and robotics at Carnegie Mellon and codirector of the QoLT ERC. “It’s much broader, including wearable technology, cell phones, sensors in the home and community, or robots that transport people such as intelligent wheelchairs and cars.” He believes that, rather than all-encompassing, highly intelligent C-3PO–like androids, small-scale devices that build “robot-person symbiosis” can help people live independently. This interconnectivity is exemplified by a concept Kanade calls “first person vision,” which uses a camera located on the shirt lapel or within eyeglasses (he envisions an eventual electronic interface through the brain to the eye) that would enable a computer to familiarize itself with all the elements of an older adult’s environments. “Like in a horror movie when you see a scene from the character’s point of view, you understand what they are thinking and can tell what they’ll do next,” he says. The vision tool, which is still in development, would be equipped with facial recognition software to remind the user of people’s names, and it could help with driving and even take control of the car for short preprogrammed stints. Ideally, the system is familiar with individuals’ capabilities and helps only with tasks they’re unable to perform. “Independence is indeed the most basic quality of life,” Kanade says. Also designed to help older adults with cognitive disorders are Mataric’s “socially assistive robots.” At her USC Interaction Lab, researchers have developed machines that provide social aid through physically embodied systems. Something similar to Bandit-II, a child-size therapist robot on wheels with a humanlike torso, may someday be available in homes and long-term care facilities to assist with the high level of attention required to care for Alzheimer patients. It could also provide nonpharmacological treatments for people with dementia. To create a humanlike interaction, Mataric’s researchers created a platform that was anthropomorphic and childlike in appearance. “We did research and found that if the robot is more than a certain height, it is intimidating. Its humanoid form implies a sense of cognitive abilities. We are not trying to create pets because we want authority. We’re interested in these machines improving quality of life through influential behavior,” she says. Mataric’s robots are designed to act as buddies and coaches to encourage activities such as listening, gait exercises, and communication with loved ones. “The robot is not the boss; nobody likes that. We create something that is interesting, dynamic, and challenging for the user. The robot is a companion. It plays games with them but not in competition. It will ask them to push a button or to sing a song. For example, it will say, ‘This song has to do with the weather. It’s about rain. It’s called ‘Singing in the Rain.’ Then it can sing the song but not beautifully. It’s not a perfect robot.” A coach enlivens what the person normally does, she says, taking them out of their comfort zones and challenging them. The market lag for products moving from concept in research laboratories to the market can take longer than 10 years, says Bryan Adams, PhD, principal investigator at iRobot. Research on the Roomba began in the late 1980s; the vacuum cleaner was released at the turn of the century. Similarly, he says, Massachusetts Institute of Technology's assistive robot, Domo, completed in 2007, which sees faces, recognizes objects, and has the ability to carry out simple tasks such as identifying objects and placing them on a shelf, may not be on the market for years, if ever. Another barrier to bringing robotic technologies into households, especially in the United States, is the lack of federal funding, the bulk of which goes to building robots for military use. “The governments in Europe, Japan, and Korea have taken an active role in pushing robotics for healthcare,” Adams says. Comparatively, he and other scientists concur that the U.S. government has not yet identified robotics for medical use as a national priority. Abroad, impressive industry developments include Toyota’s wheelchairlike partner robot Mobina that carries users or serves as a porter for those who prefer to walk. It can traverse rough terrain and, with independent left and right wheels, can even go up steps. Honda’s ASIMO, which stands for Advanced Step in Innovative Mobility, is 4 feet, 3 inches tall and can walk at a healthy clip of 2 miles per hour—about the same pace as a leisurely human gait. ASIMO is Internet enabled, provides weather reports, and recognizes gestures, objects, environments, sounds, and faces. Functioning prototypes currently cost around $1 million to build, although Kanade predicts estimates that partner robots, if they were to become available on the market, would cost in the tens of thousands of dollars. In the United States, although robot advancement doesn’t lack innovation, it fails to provide the network of support compared with other countries that bring products into the market, according to Adams. “The money goes to breaking a scientific barrier rather than to integrating the technology into society,” he says, citing the gap in funding that would resolve issues of reimbursement required to purchase new technologies and put them into households of older adults in need. Cooper has successfully spun out several products on the market, such as the SmartWheel, the only commercial product in the world that measures propulsion biomechanics in the natural environment of the wheelchair user. The GameCycle, developed using the Nintendo GameCube platform, is a therapeutic exercise machine and racing video game that uses arm cranks and steers by tilting left and right. Mataric terms a similar user-first concept “participatory action research. You find out what real people think and what they really want. It’s going to be different than what doctors, nurses, and theory books say. We’re creating technology for the specific user and for their caregivers. That’s how I know people don’t want cameras everywhere. It’s not a technology push; it’s a market pull.” She recalls being humbled by the testimonies from late-stage Alzheimer’s patients who used socially assistive robots. “People would say things like, ‘I don’t want to go anywhere because I want to see my robot,’ and ‘this is an important day because I’m going to see the robot.’ One woman thought it was her grandchild,” she says. From an industry point of view, Adams sees particular promise in robots that assist with medical compliance and cognitive wellness. He also sees potential for caregivers in a mobile robot that allows users to communicate through video with the outside world. While it may still be a decade or so before any of the current prototypes for personal and service robots become available, it is certain that widespread uses of some of the smaller, single-function technologies such as the iShoe and NavPrescience are right around the corner.